NEWS-LEADING DEVELOPMENTS 8 E&MJ • JUNE 2018 www.e-mj.com Canpotex Opens Sales Office in Brazil Canpotex Ltd. has opened a sales office in São Paulo. Brazil is now the largest market for Canpotex potash. "Brazil is among Canpotex's most im- portant markets with almost a quarter of our potash destined for Brazilian custom- ers," said Ken Seitz, CEO of Canpotex. "Our presence in Brazil will make it easier to stay close to our customers and work directly with distributors to support farm- ers, who use potash to grow their crops. Our goal is to capitalize on expected growth in demand in Brazil and improve our position in this already competitive market environment." Since 1972, Canpotex has exported ap- proximately 35 million metric tons of pot- ash to Brazil. The group markets Canadian potash to approximately 40 countries. Yamana Pours First Gold, Silver at Cerro Moro Yamana Gold announced the first pour of gold and silver doré at Cerro Moro oc- curred on May 15. Located in the Santa Cruz province of Argentina, Cerro Moro is a high-grade gold and silver operation ex- tracting ore from a combination of under- ground and open-pit mining. The compa- ny said the production ramp up at Cerro Moro continues to track according to plan with commercial production expected in the second quarter of 2018. Most of Cerro Moro's 2018 production will occur in the second half of the year. 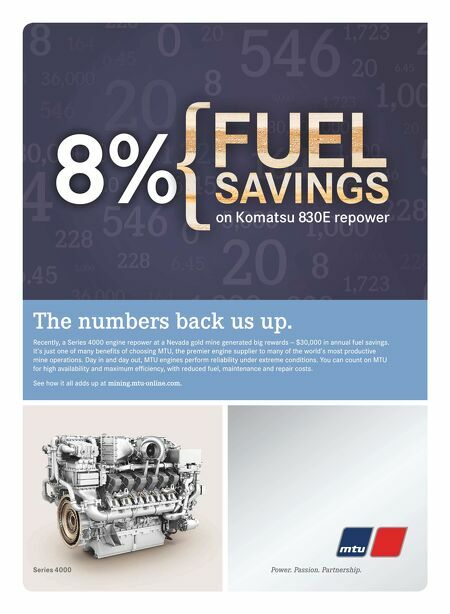 With the ramp up of production under way, Yamana is focusing on ensuring mill throughput rates reach nameplate capac- ity of 1,000 metric tons per day (mt/d), and that grades and recoveries reconcile to plan. The company said ramp up of mining and milling is well on track, with the major equipment performing to de- sign during usual performance tests and commencement of operations. While the ramp up remains the primary focus, ef- forts are already shifting to optimize the operation and, in particular, ensure that operating costs reach guidance levels. The stockpile at Cerro Moro has con - tinued to increase since year-end 2017 and through the first quarter of 2018. As of May 6, the stockpile was estimated at 42,300 mt at 21.5 grams per mt (g/ mt) of gold and 995 g/mt of silver, pro- viding added flexibility to the mine plan for 2018. The operation has reached the planned six weeks of stockpiled ore, ahead of schedule, which was originally the end of this quarter, and the grades are higher than planned. For 2018 and 2019, the company expects average co-product cash costs of $500 per ounce (oz) gold and $6.70/oz silver, and co-product AISC of $650/oz gold and $8.85/oz silver. Yamana has also set an exploration objective of adding 1 million gold equiv- alent oz (GEO) to the mineral inventory at Cerro Moro in the next several years. Achieving this goal should provide further options for mine development including the potential to add a dedicated power line. The company has allocated $11.2 million for exploration in 2018. The objectives for the 2018 explora- tion program are to convert 110,000 GEO of inferred mineral resources to measured and indicated mineral resources; discov- er 250,000 GEO of new inferred mineral resources; and define future drill targets through scout drilling, soil and rock sam- pling, and mapping. Drilling relating to the mineral re- source conversion objective began in the second quarter as planned and the company believes that this objective is achievable by year-end. Vedanta Studying Zinc Smelter-Refinery Complex for Gamsberg Vedanta Zinc International, a subsidi- ary of London-listed Vedanta Resources, has initiated a feasibility study into the development of a zinc smelter-refinery complex to process concentrates from its Gamsberg project at Black Mountain Mining in the Northern Cape Province, South Africa. Phase 1 of the $400 mil- lion Gamsberg mine is scheduled to begin production in mid-2018 and to reach full production in nine to 12 months. Phase 1 will have a mine life of 13 years, produc- ing an expected 4 million metric tons per year (mt/y) of concentrator feed from the open-pit mine and 250,000 mt/y of zinc in concentrate. Development of the zinc smelter- refinery complex could see a further in- vestment of between $700 million and $800 million. Establishment of the proposed smelt- er-refinery complex would make Gamsberg the first fully integrated zinc production facility in South Africa. Vedanta current- ly anticipates that the complex will have capacity to produce 250,000 mt/y of fin- ished zinc metal. The Gamsberg project is designed to be developed in a modular fashion, and the smelter-refinery complex could be expanded to align with Phases 2 and 3 of the Gamsberg mine. The feasibility study will evaluate the infrastructure requirements of the complex, which will require around 200 megawatts (MW) of additional power and additional water supply. Both would re- quire significant large-scale investment. The scope of the feasibility study includes a review of previous work by Vedanta into the possibility of develop- ing a Southern African zinc cluster that would incorporate both Black Mountain and Skorpion Zinc, which is located in southern Namibia. Skorpion Zinc currently operates an integrated zinc refinery, and the potential exists for conversion of the 150,000- mt/y refinery to co-treat sulphide and oxide concentrates from Gamsberg and other sulphide concentrate raw materials from nearby locations. Should these pro- jects proceed, this Southern African zinc cluster has the potential to be one of the world's largest zinc supply regions. 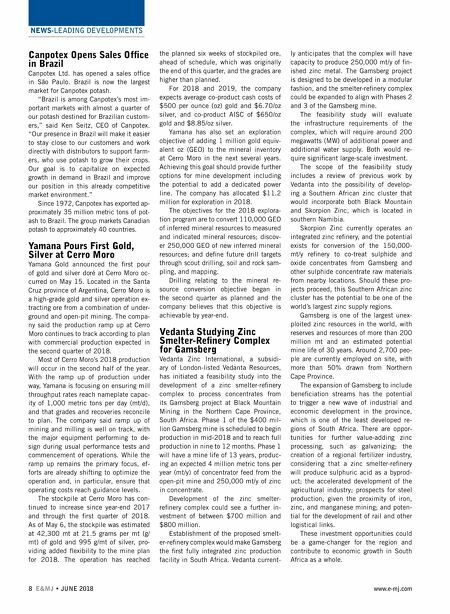 Gamsberg is one of the largest unex- ploited zinc resources in the world, with reserves and resources of more than 200 million mt and an estimated potential mine life of 30 years. Around 2,700 peo- ple are currently employed on site, with more than 50% drawn from Northern Cape Province. The expansion of Gamsberg to include beneficiation streams has the potential to trigger a new wave of industrial and economic development in the province, which is one of the least developed re- gions of South Africa. There are oppor- tunities for further value-adding zinc processing, such as galvanizing; the creation of a regional fertilizer industry, considering that a zinc smelter-refinery will produce sulphuric acid as a byprod- uct; the accelerated development of the agricultural industry; prospects for steel production, given the proximity of iron, zinc, and manganese mining; and poten- tial for the development of rail and other logistical links. These investment opportunities could be a game-changer for the region and contribute to economic growth in South Africa as a whole.